Dutch airline KLM has announced that it will use a biofuel generated from used cooking oil to power more than 200 commercial flights between Paris and Amsterdam starting in September. (AP) -- Dutch airline KLM plans to use recycled cooking oil as biofuel to power flights to and from France in a move aimed at cutting carbon emissions. Starting in September, KLM will begin more than 200 flights between Paris and Amsterdam using biofuel made from used cooking oil, the company said Wednesday. KLM managing director Camiel Eurlings said in a statement the airline does not have to make any changes to its aircraft engines to use the new biofuel. The biofuel flights are intended to help reduce KLM's carbon emissions while having a "minimum negative impact on biodiversity and food supply." Air travel is responsible for about 3 percent of greenhouse gases, but their share of global emissions is rising rapidly. The European Union told airlines earlier this year they would have to cut their carbon emissions by three percent on flights to the continent in 2012 to fall within new pollution limits. The limit is designed to encourage airlines to reduce greenhouse gases that contribute to global warming by switching to cleaner fuels or economizing on fuel consumption with lighter aircraft or more efficient flight patterns. Eurlings said he expects authorization to be granted soon for KLM's flights using the new fuel. An Air France-KLM Boeing 747 using a 50 percent biofuel mix in one engine successfully completed a demonstration flight in the Netherlands in November 2009. Forty people flew on the 90-minute trip, including the Dutch economic affairs minister, and the airlines said it was the first flight using biofuel to carry passengers. 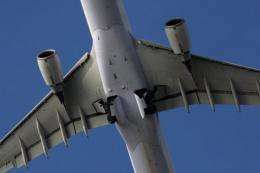 The plane had a 50-50 mix of biofuel and regular jet fuel in one of its four engines. Virgin, Air New Zealand, Air Japan and Continental Airlines have previously completed similar demonstration flights using biofuel mixes. ©2011 The Associated Press. All rights reserved. This material may not be published, broadcast, rewritten or redistributed. Aviation biofuel proves itself in tests, but is there enough?